Gegenbaur's book Grundzüge der vergleichenden Anatomie (1859; Elements of Comparative Anatomy) became the standard textbook, at the time, of evolutionary morphology, emphasizing that structural similarities among various animals provide clues to their evolutionary history. 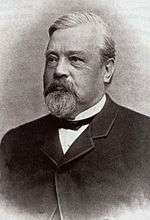 Karl Gegenbaur noted that the most reliable clue to evolutionary history is homology, the comparison of anatomical parts which have a common evolutionary origin. The work by which Gegenbaur is best known is his Grundriss der vergleichenden Anatomie (Leipzig, 1874; 2nd edition, 1878), translated into English by W. F. Jeffrey Bell (as Elements of Comparative Anatomy, 1878), with additions by E. Ray Lankester. While recognizing the importance of comparative embryology in the study of descent, Gegenbaur laid stress on the higher value of comparative anatomy as the basis of the study of homologies, i.e. of the relations between corresponding parts in different animals, as, for example, the arm of man, with the foreleg of a horse, and with the wing of a fowl. A distinctive piece of work was effected by him in 1871 in supplementing the evidence adduced by Huxley in refutation of the skull-vertebrae theory: the theory of the origin of the skull from expanded vertebrae, which, formulated independently by Goethe and Oken, had been championed by Owen. Huxley demonstrated that the skull is built up of cartilaginous pieces; Gegenbaur showed that in the lowest (gristly) fishes, where hints of the original vertebrae might be most expected, the skull is an unsegmented gristly brain-box, and that in higher forms, the vertebral nature of the skull cannot be maintained, since many of the bones, notably those along the top of the skull, arise in the skin. 1 2 3 4 5 6 "Karl Gegenbaur - Encyclopaedia Britannica" (biography), Encyclopædia Britannica, 2006, Britannica.com Britannica-KarlG. ↑ Also titled "Grundriss der vergleichenden Anatomie" (1859), "Biodiversity Heritage Library", biodivlib-Anatomy. 1 2 3 4 "Carl Gegenbaur - Wikipedia" (German), German Wikipedia, 2006-10-29, de.wikipedia.org webpage: GermanWP-CarlGegenbaur. ↑ "Book of Members, 1780–2010: Chapter B" (PDF). American Academy of Arts and Sciences. Retrieved 11 September 2016. Chisholm, Hugh, ed. (1911). "Gegenbaur, Carl". Encyclopædia Britannica (11th ed.). Cambridge University Press. Wikimedia Commons has media related to Karl Gegenbaur.